- Publisher In over thirty engagingly written and illustrated pieces Peter Jeffery applies the good news of the Christian faith and teaching in a way you and others will love reading about it. These tracts are supplied on three formats PDFs US letter size for folding and UK A4 size for folding and as HTML text so you can load them on your website. Purchase of this CD licenses you or your church or your Christian organization to print and distribute as many of these tracts as you wish and to publish and circulate them electronically by email or on the world wide web. 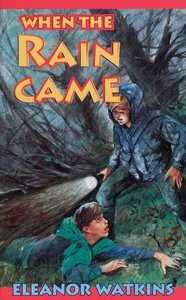 About "When the Rain Came"
In over thirty engagingly written and illustrated pieces Peter Jeffery applies the good news of the Christian faith and teaching in a way you and others will love reading about it. These tracts are supplied on three formats PDFs US letter size for folding and UK A4 size for folding and as HTML text so you can load them on your website. Purchase of this CD licenses you or your church or your Christian organization to print and distribute as many of these tracts as you wish and to publish and circulate them electronically by email or on the world wide web.